According to the Israeli Prison Service (IPS), as of 31 December 2018 there were 5,370 Palestinians (West Bank, East Jerusalem, Gaza) held as “security prisoners” in detention facilities including 203 children (12-17 years). In the case of children there was a 6% decrease in the number compared with the previous month and an annual decrease of 13% compared with 2017. These figures include 2 children held in administrative detention. According to the IPS, 49% of child detainees were unlawfully transferred and/or detained in Israel in violation of Article 76 of the Fourth Geneva Convention in December. 92 Australian politicians have written to UNICEF’s Special Representative in Jerusalem urging the UN agency not to abandon earlier commitments to publish periodic updates to its report – Children in Israeli Military Detention. UNICEF has not provided any periodic updates to the 2013 report since February 2015 and has stated that it has “no firm plans” to do so in spite of earlier commitments. Since the publication of the report just 1 of UNICEF’s 38 recommendations has been substantially implemented by the military authorities and detention rates have risen by 36%. A pilot scheme to issue summonses in lieu of night arrests was introduced in 2014 following concerns about the arrest of Palestinian children at night. Between 2014 and 2018, the percentage of children arrested at night has risen from 46% to 52% of cases documented by MCW. Based on 53 cases so far documented by MCW from 2018, summonses were issued in 13% of arrests. In the 7 cases documented by MCW where summonses were used, 86% were delivered at night in military raids; 43% were written in Hebrew; and 100% were complied with. Israel’s Military Court Unit in the West Bank has issued an updated briefing note. As with previous notes the update states: “The Military Courts were established in accordance with international law” and refers to “Article 66 of the Fourth Geneva Convention”. Military Order No. 3, which established the courts on 7 June 1967, also referred to the Convention as the legal basis for prosecuting Palestinian civilians in military courts. However, by August 1967 references to the Convention were deleted one month before settlers moved to the West Bank in violation of the Convention. The Fourth Geneva Convention permits the prosecution of civilians under occupation in military courts, temporarily and with conditions. One condition is that the prisons must be in the occupied territory. Transferring prisoners out of occupied territory constitutes a war crime under the Convention. This classification was adopted by the Rome Statute of the International Criminal Court. The Convention also imposes obligations on all state-parties to ensure compliance with these provisions. These obligations include those in Article 146 of the Convention. These provisions were included in the Convention based on experiences from the Second World War. In October, MCW sent follow-up correspondence to the Embassy of the Netherlands in Tel Aviv asking what specific steps the Government of the Netherlands has taken in relation to the unlawful transfer of children from the West Bank in order to satisfy its third-party state obligations under Geneva IV. In December the Embassy responded stating, inter alia, that “the Netherlands shares your concerns regarding the treatment of Palestinian minors” and “expects Israel to respect and strictly comply with the provisions of Geneva IV”. The correspondence however makes no reference to third-party state obligations. 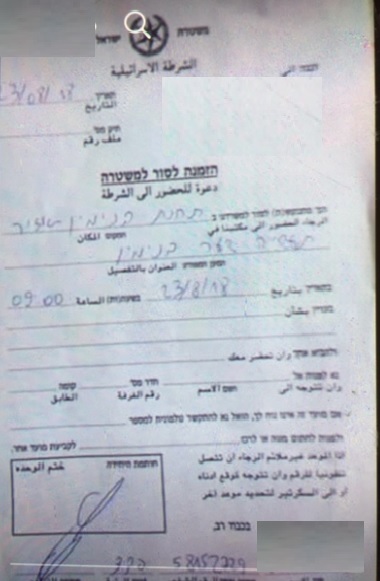 On 13 October 2018, a 14-year-old boy from Tuqu was served with a summons by Israeli soldiers at 3:00 a.m. The boy complied with the summons but was arrested by soldiers on 14 October at 4:00 a.m.